Crumpets are a delicious way to start a morning. We always used to have crumpets in my house when I was growing up and I ate them frequently as I considered them a more interesting alternative to regular toast. Thick, spongy, and porous they are perfect dripping with butter and covered in either honey, or a spread of Vegemite (for the Aussies amongst us). Unfortunately, crumpets aren’t that easy to come by here in Vancouver but I have discovered them in the Whole Foods on Cambie Street. If you’ve not had a chance to try crumpets yet, this dish is a tasty, and slightly fancy, introduction. Essentially this dish is French Toast made with crumpets, rather than bread. The chilli adds a nice touch and isn’t too obvious, and as the crumpets are neither sweet nor savoury, you really can personalize it with your choice of topping. My only tip with this recipe is that you may need three eggs instead of just two to make the egg mixture, depending on how quickly your crumpets absorb the eggs. Overall, this is a yummy, fast way to enjoy crumpets and breakfast. Crack your eggs into a bowl and give them a little whisk with a small pinch of salt and pepper and most of the chopped chilli. Then heat a large, non-stick frying pan over a medium heat and fry the bacon in a tiny amount of olive oil. Let it crisp up on both sides. Meanwhile, get your crumpets and really push them into the egg and chilli mixture. Turn them over a few times – they’ll soak it up like a sponge. Push the golden bacon to one side and tilt the pan so the fat runs into the middle. Add the crumpets to the pan and fry them for a few minutes until golden, then turn them over and fry them on the other side. 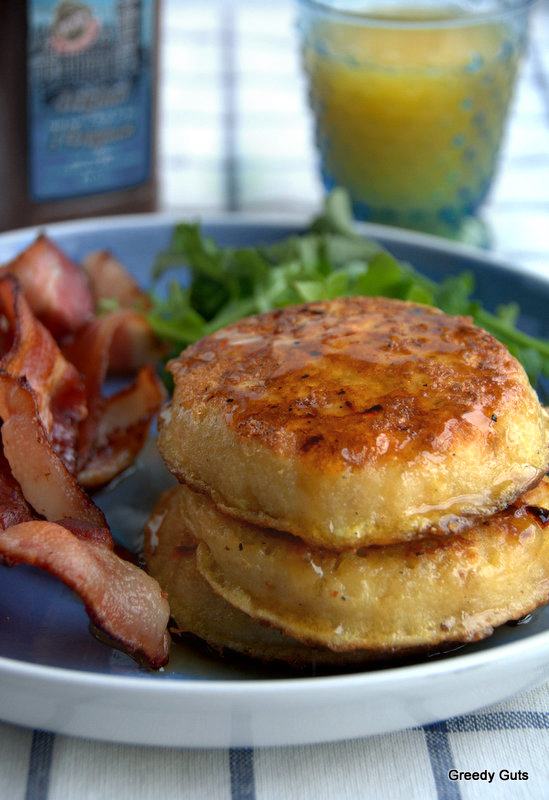 Serve the eggy crumpets topped with the crispy bacon, with a dollop of brown sauce or a drizzle of maple syrup. To finish, you can sprinkle over the extra chopped chilli (if desired). Not a silly question at all! They are a British griddle cake so not surprising that some folks don’t know them: http://en.wikipedia.org/wiki/Crumpet. They are a good substitute for toast at breakfast or a snack. Oh I see, thanks for the explanation!